About once every month Sorority NYX goes out and has an activity with another sorority or fraternity. Activities vary from canoeing on the canals of Breda, to beer tasting, to simply playing some charades. Here we chat, laugh and most important, get to know each other! Every year Sorority NYX throws an introductory party (the first party after the Intersib), a birthday party (somewhere around our birthday; the 26th of November) and one or two other parties. These parties are open for all public. Check the milestone on the left for our next party! Several times a year Sorority NYX throws a potential members drink. Are you interested in joining a Sorority and do you want the opportunity to get to know ours? Check what we’re all about and feel free to contact us at [email protected]! Next to Studio Dependance, every Wednesday you can find Sorority NYX in Café Dunne, our Student Association S.V. Xenia‘s home bar. We also attend all S.V. Xenia parties and activities. Every year Sorority NYX joins the introduction week of the freshmen of International Hotel Management and International Real Estate and Facility management of the NHTV. We either work as a ‘Mama’, in the Intersib Committee or in the crew. At night you can recognize us by our Sorority NYX shirts and vests, with the logo on the back. Every year Sorority NYX goes on an annual trip, in short; the NAT. We go for a weekend, have activities, go out and enjoy our time to get her. We already turned Volendam, Budapest, Glasgow, Marseilles, the Ardennen and Texel up side down! Once a year Sorority NYX throws a relative day. This is the chance for our mother,father, brothers, sisters or best friends to get to know the Sorority. Every year we have an other activity and enjoy our day with the company of our fellow members and love ones. Every year Sorority NYX participates in the ‘Bredase Klûntocht’, which takes placearound a month before carnival. 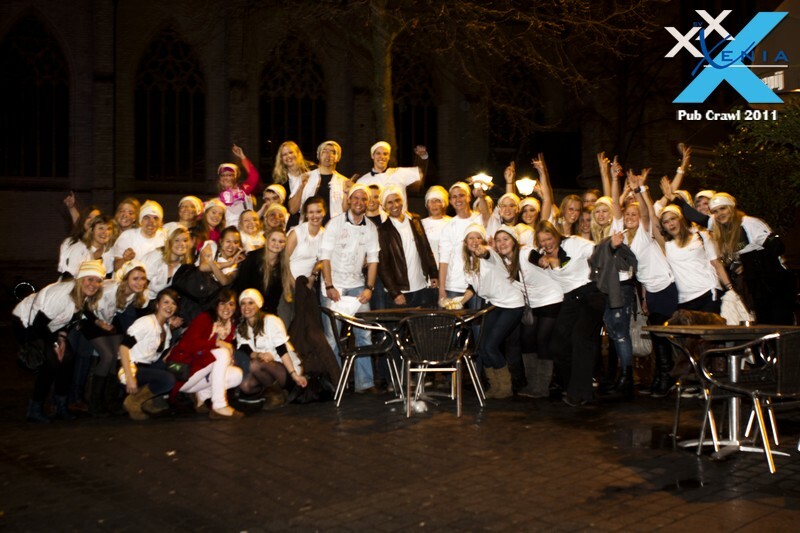 We dress up and take our Sorority to the city centre of Breda for a pub-crawl. The goal is to have a drink at as many pubs as possible. When completed the checklist of pubs you get a medal. in 2011 we even competed in the contest of ‘the best Klûnende studenten 2011’: the best Klûning students of 2011. After a day full of games and drinks, at the award ceremony turned out.. that we won! We saved our price, a kag of beer, for one of our parties. It was another great evening! Every year we have our official board change in January or February. Traditionally we do this during a high tea. We drink tea, eat everything from sandwiches to cakes to chocolates, reminisce about the past year, have speeches and officially change of board. Another activity of Sorority NYX are our Old Members Drinks. A drink especially for our graduated members! We have drinks, chats and enjoy seeing everyone again. When a Sorority NYX goddess turns 21, all members of Sorority NYX dress up and travel trough the country for a 21-dinner at her parents place. We have a culunary 3 (or more) course dinner, drink wine, chat, laugh, have speeches and afterwards go out in the members hometown.